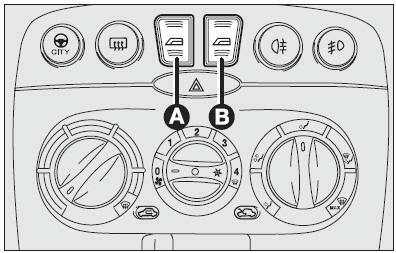 to press button (A) for longer than half a second to activate the automatic operation of the driver’s window: the window will stop when it reaches the end of its travel or until the button is pressed again. Improper use of the electric windows can be dangerous. Before and during their operation ensure that any passengers are not at risk from the moving glass either by personal objects getting caught in the mechanism or by being injured by it directly. Always remove the ignition key when you get out of the car to prevent the electric windows being operated accidentally and constituting a danger to the people left in the car.